With a vibrant creative scene pushing Bali based fashion brands towards greater international recognition, its jewelry designers are carving, bending and shaping their own place on the fashion radar. With a rich eco-system of skilled craftsmen and women, easy access to raw materials and a daily dose of island-life inspiration, it is little wonder that a dynamic jewelry industry exists combining local skills with the best of international design talent. Almost all of Bali´s jewelry is hand-made by skilled craftsmen and women expressing their rich woodworking and stone-carving heritage that has been passed down from their ancestors. Any casual observer will quickly notice the refined carving skills on display on temple walls, statues and many wooden structures throughout the island. Ironically though, Bali does not have a jewelry culture itself, with such artisanal skills traditionally employed in temple construction and woodworking tasks. This represents the richness of the islands´ cultural and creative heritage and its´ ability to re-apply itself to new endeavors. Artisans themselves unconsciously transfer their cultural heritage onto the jewelry pieces they create, and this combination with talented international designers is why Balinese jewelry brands are so exciting to watch. Here we list our favorite ones, from established names to up and coming designers worth watching. 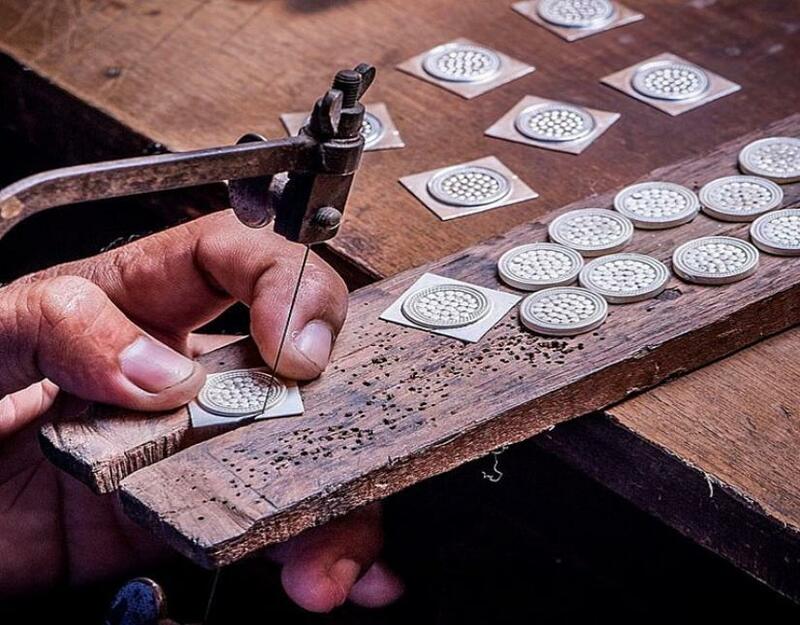 Perhaps the most established of the Bali jewelry brands, John Hardy started as a visionary pioneer in the 70´s, recognizing Bali´s artistic heritage as an opportunity to create a unique and sustainable business. As a trained sculptor, Hardy began designing one-of-a-kind silver pieces with the help of local artisans and from these humble beginnings and several changes in ownership later, his vision has propelled it into one of Bali´s most internationally recognized brands. Represented at high-end stores like Neiman Marcus and backed by eco-conscious celebrities such as Julianne Moore, the original workshop has continued to grow over the last 40 years and currently employs a network of 750 local artisans. Using recycled silver and gold, John Hardy´s collections specialize in intricately chain woven pieces featuring rich traditional motifs such as the naga, a serpent embellishing a bracelet or clasps in the shape of a cobra. Each item is made by hand and eschews modern artificial design processes, instead sticking to hand-sketched, wax carving, casting and the setting of each piece, a process taking over several days. Such dedication to craft ensures that each piece is unique. Vanessa Montiel´s designs feature shapes and motifs inspired by nature and all living beings, both real and mythical. Her use of gold and silver as the base for innovative structural jewelry design is interwoven with a unique material that complements her bold yet spiritual creative vision; black buffalo horn. Using horn for decorative embellishments as well as for key component parts means that her collections are imbued with a living, spiritual quality. Horn carvings are traditionally presented as offerings to ancestors, a tradition she has translated to her collections as she creatively manipulates this natural by-product. In addition, it introduces a dramatic black design element in her pieces that is unique to her collections. While not surfing Bali´s beautiful breaks, this former student of sculpture and fine arts is currently working on launching more collections for her international fan-base. With many plans currently under development and the relaunch of the brand worldwide, we are expecting to see more of her innovative designs hitting stores soon. The beautiful Allegra Lipanje is the creative force behind Haywire Jewelry, a brand that brings an edgy, bold andoff-beat vision to its designs which sets it apart from its peers. Her creative inspiration starts from the concept of neglected beauty, manipulating the unexpected and embracing the unusual to craft unique pieces that are different to much of what you will see in Bali and essentially anywhere else. Semi-precious stones, the manipulation of metals, and unique structural creations such as safety pins, rubix cube rings and knuckledusters provide a range and breadth to her collections that is refreshing. With each item hand-made, the proverbial ´diamond in the rough´ is transformed into something beautiful, with rich symbolism and stories that she feels jewelry should tell the world. The role of jewelry is to share the journey of life, to manifest one´s emotions, and for a piece to be more than an inanimate object but to share the soul of its wearer. There is a lot in her collections to appeal to the jewelry lover, especially those with the freedom and daring to be different. For a minimalist and elegant look that is at the same time classic, we happily recognize Bahagia Jewelry as the go-to brand in Bali. Designer Camila Felizardo´s collections appeal to lovers of beautifully designed jewelry that contains subtle design touches, colors and dimensions that make it feel modern. Versatile pieces that can fit and complement any occasion, her designs can be worn every day without seeming like the everyday. Starting with clean cut, non-angular and classic lines, she builds collections that interweave delicate touches to make them appear more multi-dimensional and detailed thereby departing from classically designed jewelry that can be at times be, well, classic. Small scale production in Bali ensures that the pieces remain true to her vision, while her varied influences ensure that this Aussie based designer keeps her collections fresh. Reasonable prices and easy to wear, what is there not to love? While many designers try to bend, shape and manipulate materials to their creative will, Natalie Dissel’s collections are not afraid to let the raw beauty of gemstones and minerals be the centrepiece of her designs. Furthermore, she is not one to limit herself to the materials she uses with stones such as demontoid, citrine andamethyst and minerals such as Dolomite and Calcite forming part of her collections. Created through the forces of nature over thousands of years, her selected stones and minerals exude a raw and natural beauty. At the same time, the pieces are delicately set and refined by skilled craftsmen to create pieces that are modern, bold and edgy. Her credo of travel and absorb, has meant that she has not shied away from other materials such as shell or horn, and sources her materials from all corners of the globe. Such inspiration means that her necklaces, rings and bracelets come with their own travelogues from Asia, Africa and the Middle East allowing for a natural creative evolution from one collection to the next. Anna Beck, the brainchild of designer Becky Hosmer is a wonderful example of the synergy between international jewelry design combined with Balinese inspiration and craftsmanship. Hand-made in Bali, using traditional techniques, the brand can be found in department stores such as Nordstrom and high-end boutiques worldwide. What started as a visit to Bali in 2002 has developed into a fully-fledged jewelry operation with 100 silversmiths dedicated to creating her beautiful designs. Evolving collections showcase an alternating use of stones such as sapphire, blue-pearl and howlite, while also maintaining a design consistency that ensures that each item can be recognized as being signature Anna Beck. Dozens of gold and silver petals adorn her pieces, each in-laid by hand over several days, creating a subtle yet beautiful motif. This motif adorns many of her pieces making them feel classic, beautiful and brimming with a casual elegance that is wearable throughout the the day. Her synergy with Bali also extends to her involvement in the local community with the Bumi Sehat foundation, with proceeds from a dedicated collection helping to provide health and emergency care to expectant mothers. Her belief in giving back and showing generosity of spirit is also shown in her support of the David Sheldrick Charity which seeks to preserve wild elephants in Kenya. She wishes for her jewelry to also represent these values, that they are more than simply objects but are part of a physical connection to something deeper. Like many brands, Monsieur Blonde has every intention to make a woman look and feel beautiful. Only this french inspired label achieving this with their elegant jewelry and lingerie collections, a killer combination if we ever saw one. If it’s their jewelry you’re after, Monsieur Blonde creates focused collections with geometric designs that play with multiple shapes, sizes and their relative positions in bohemian inspired pieces. With the use of gemstones adding a dash of color and gold plated rings, earrings and necklaces flattering sunkissed skin, their structured pieces can be worn every day. Already being sold in more than a dozen countries worldwide, the collections represent the deeply personal creative process of designer Delphine Leveque who draws her inspiration from her childhood memories, personal style choices and local craftsmen and their materials. Handmade in Bali, inspired by Bali and sold around the world in designer boutiques, Monsieur Blonde captures the boho-chic look like no-one else. As with any designer, the process of creation and design is a very personal one. Merging this inspiration into a compelling vision not only showcases a designers’ style but also her personal journey; and this is what makes discovering brands like Vika Jewels so exciting! What we love about Vika Jewels are how its collections represent the designer in a coherent, consistent and compelling way. Sharing her personal experience as a model where she was exposed to high-end jewelry and fashion, she brings a down to earth touch meaning that her collections are made with the everyday woman in mind. Vika’s collections feature wearable pieces that fit with every outfit any time of the day and transmit an aura of sleek sophistication, modern design and sexiness that adorn the whole body. Her recent collection has a greater focus on silver, particularly recycled silver that is handcrafted in Bali. While sticking to her design vision of creating high-end pieces for everyday wear, her latest designs has seen her take a more edgy turn with more structural elements such as pins, razor and locks designed into pendant, earrings and necklaces. The tricky thing for any fan of this brand, is that with so many approachable and easy to wear pieces, it is hard to limit yourself only one piece! Just when you thought that we have shared with you the most exciting designers that Bali has to offer, this creative hub will always throw up surprises. The last but certainly not least on our list is Ceramic by Ava. This Russian beauty stands out for her ability to stick to a strict geometric design motif while expertly manipulating porcelain elements into her jewelry. The complementary synergy of luxurious silver and gold with the smooth aspect of handcrafted Spanish porcelain, has resulted in a range of jewelry items that are classy, minimalist and easy to wear. The strong geometric design aspect throughout her collections is as much decorative as it is symbolic. Integrating the triangle shape into many of her designs, Ceramic by Ava draws upon the strong symbolism this shape has in different philosophies and religions around the world. In addition, while much geometric design tries to manipulate sizes, shapes and their relative positions, Ceramic by Ava keeps it simple; and herein lies its essence. What we like is that she has stayed true to her artistic vision and persevered until she found the materials that complemented her design vision, rather than the reverse. This means an uncompromising discipline to a vision and a collection that stands apart not only in design but also material construct. Simplicity and synergy do the talking here, which very much like the geometric triangle, is strong and enduring.